Vintage Outfits : Picture Description Ceil Chapman lace party dress, c.1950, from the Vintage Textile archives. Vintage Photography : Sophie Litvak / photo by Georges Dambier, Paris, 1952…. 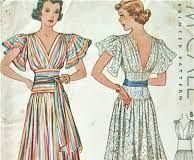 Vintage Outfits : 1950's novelty print halter dress by Alex Coleman.